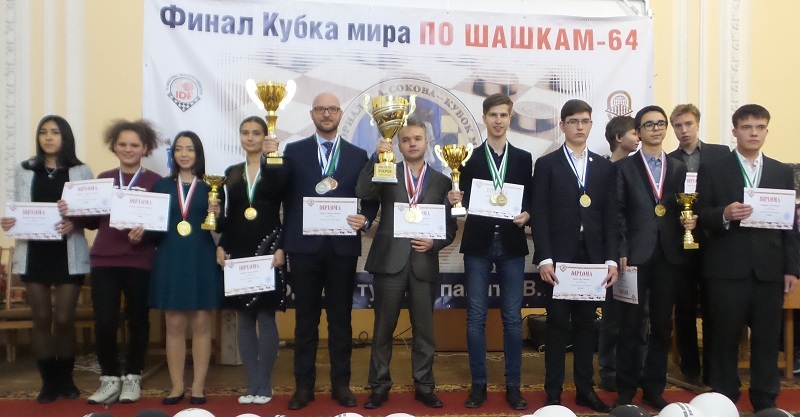 1 International competition «Portugal – 2016» Rapid PT Tiago M.
2 International competition «Rimini – 2016» Rapid IT Tsinman D.
3 International competition «White Nights – 2016» Blitz BR Belosheev S.
4 International competition «Cup of Information Technology» Blitz RUS Belosheev S.
5 International competition «France – 2016» Blitz RUS Skrabov V.
6 International competition «Israel – 2016» Blitz BR Sarshaeva Z. International competition memory Vasily Sokov Blitz RUS Tokkusarov I. More than 260 players from 38 countries (Australia, Austria, Azerbaijan, Angola, Armenia, Belarus, Hungary, Vietnam, Ghana, Germany, Georgia, Israel, Kazakhstan, Cyprus, Congo (DR), Congo (BR), Latvia, Lithuania, Malta, Morocco, Moldova, Mongolia, Nigeria, Norway, Poland, Portugal, Romania, Russia, Tajikistan, Turkmenistan, Ukraine, United States, Uzbekistan, Estonia, France, Sweden, Switzerland, Sri Lanka) took part in the classic and blitz programs of the World Cup 2016.